The Exclusion Zone contagion is spreading. Queensland: Exclusion-zones went into force this week in Queensland, along with the state’s new act that moved abortion into the health code. Queensland is the fourth Australian state to enact the zones – this includes New South Wales, where abortion is still technically illegal; both territories also have the so-called ‘Safe-Access’ zones. “1 The inherent dignity and worth of all human beings. This Bill excludes only one group – and without any attempt at justification – from the circle of human rights protection, the children before birth. Clearly the drafters of this human rights Bill recognised that the recently passed Termination of Pregnancy Act would contravene the human rights of the unborn child so they avoided that problem by simply declaring that the unborn are excluded from the Bill. In my submission on the Bill (only a few weeks were given for people to make submissions and that period has now closed) I asked what respect would anyone have if in 1850 in Alabama a Human Rights Bill had been put forward that specifically left laws allowing slavery to go untouched. It is equally absurd that this Queensland human rights bill specifically leaves laws allowing the killing of unborn babies to go untouched. The Bill must be rejected. Ms Franks believes SA’s laws are ‘out of date’, since women must have lived in the state for two months before being able to access an abortion. Franks claims this disadvantages international students. One wonders how high the numbers of young women in this situation must be, to warrant a complete overhaul of abortion law. One wonders, also, how prevalent are the incidents of ‘harassment’ and ‘intimidation’ of women entering abortion mills or whether, as in other states and countries around the world, there is little evidence of that kind of activity. Don’t think the medical world is unbiased. It would appear that there is little hope of unbiased reporting to be had anywhere – even in medical journals. The November edition of Australian Doctor, sent to me by a supporter, featured an article on our High Court challenge to exclusion-zones, and how this poses a threat to concerned abortionists everywhere. Concerned – perhaps not so much for the welfare of their patients, and certainly not for the welfare of their patients’ offspring – but for their declining revenues when mothers accept help from sidewalk advocates. The article included a lengthy statement from abortionist Philip Goldstone, medical director of Marie Stopes Australia, who claimed that he had been abused many times by pro-life activists. Goldstone claimed that he had been told “on a weekly basis” that he was going to hell. He also claimed, wrongly that pro-lifers believe abortion to be an “unforgivable sin.” This is probably the most damaging kind of propaganda out there: women and men, and even abortionists, need to hear that the sin of abortion can be forgiven. All that is necessary is repentance from sin and faith in Christ. The article contained no statements from pro-life medical professionals, or post-abortion counsellors or medical staff who had cared for mothers who changed their minds about having an abortion. Instead, Goldstone was free to vent his spleen over unproven accusations of verbal abuse by sidewalk advocates. He reiterated one of his favourite, but incorrect, analogies – that women who received breast enhancement are no different from women seeking to have their children killed. Goldstone fails to point out that the former is merely a matter of a woman’s choice, whereas the latter procedure involves three parties: the mother, the father and their pre-born child. But then, it’s hardly surprising that someone who kills babies for a living would completely dehumanise those babies by comparing them to a piece of silicone. Kathy Clubb is the founder of The Freedoms Project: a pro-life, pro-family and pro-freedom website. She is a member of the Helpers of God’s Precious Infants and the Melbourne co-ordinator of Family Life International, one of Australia’s most respected pro-life organisations. Kathy is also involved in a High Court challenge to Victoria’s abortuary exclusion-zones. 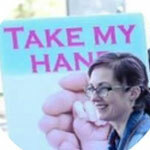 She home-educates her children and considers them to be her most important pro-life work.